British Columbia events in September 2018. It's a Lake Cruise! Held by the Okanagan Pionairs District. Thursday, September 13, 2017, from 12:00 to 2:00 PM. Boarding of the vessel is at 11:30, sailing departs at 12:00 sharp. Click Here for full details on the Okanagan page of the Pionairs website. It’s “Nearly Neil” Held by Vancouver Pionair District. Join us for a very special social event with Neil Diamond tribute artist “Nearly Neil”. Pionairs members receive a discounted rate at this event. This event is for PIONAIRS MEMBERS AND SPOUSES ONLY. September 24, 2018 09:30 (check-in) until 14:00. Click Here for full details on the Vancouver page of the Pionairs website. British Columbia's Jaye Edwards is 1 of 3 women still alive who flew Spitfires and bombers during the war. When Jaye Edwards takes a moment to reflect on her service during the Second World War, the first thing that comes to mind is a clear sky. "All the beautiful blue sky, nothing but blue sky," Edwards said, with a nostalgic sigh. "Maybe there was the odd little white puff." "You never really thought about the past — you just lived for the moment," she recounted. Edwards served as a pilot during the war. She flew more than 20 different types of planes — from Spitfires to bombers — and took flight hundreds of times. Now just a few months shy of her 100th birthday, she's one of the last surviving members of the famed "Attagirls," a group of just over 160 women who flew warplanes from factories to the front lines. When she was in her early 20s, she made good on a childhood dream to become a pilot by enrolling in the National Women's Air Reserve — a small flight school that would convene on Sundays. Five hundred training hours later, she was certified. Then, the war machine took over. "It was in '39 when I got my licence. It arrived the day after war was declared," she said. Today, Edwards is one of three remaining female ATA pilots, alongside Eleanor Wadsworth of the United Kingdom and Nancy Stratford of the United States, according to the ATA Association. Jaye Edwards holds one of her several medals received after she served Britain's Air Transport Auxiliary (ATA) during the 1940s. (Jon Hernandez/CBC). Air Canada is the first airline in North America to promote pet-sitting services thanks to a deal they've signed with Rover, North America’s largest network of five-star pet sitters and dog walkers. Travelling with your Pet from the Air Canada website. Star Alliance carrier Ethiopian Airlines has finalized a joint venture (JV) with the Chad government, paving the way for the launch of Chad’s new national carrier on October 1. 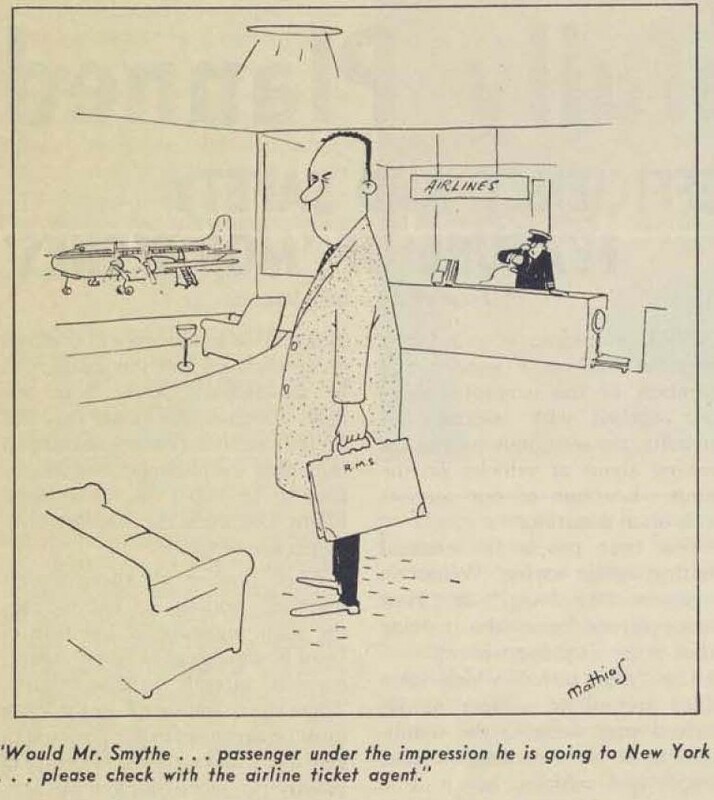 Retrieved from Air Canada's 'Horizons' magazine. B-747's leased for a 12 month period. Fin #306 (combi) to Air National of California from May 12. Fin #301 to Global International Airways of Kansas commencing June 14. Fin #303 is in short storage at Toronto. Fin #302 is in storage at Hughes Aviation Services in Las Vegas. The following DC-8's are parked at Evergreen Air Centre, Marana Air Park, Arizona. Fin #'s 816, 817, 818, 819, 860, 861, 862, 863, 865, 866, 868, 869, 870, 876. Fin #'s 815, 864, 877, 879 stored at Dorval, acting as demos for potential buyers. Fin #301 c/n 20013 with Global International and scrapped. Fin #302 c/n 20014 with Air Atlantic Icelandic and scrapped. Fin #306 c/n 20977 with Kalitta Air Mar 2003. Air Canada's first re-engined DC-8 freighter went into service on November 8, 1983, sporting new engines that will allow it to fly into the 1990's, despite stricter anti-noise regulations being introduced internationally over the next few years. The re-engining of all six of the airline's stretched DC-8-63 cargo jets is being performed at the airline's technical center in Montreal. 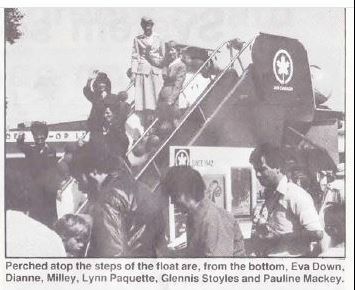 Effective December 1, 1983, all passengers and crew members on inbound international flights will complete traveller declaration cards for presentation to the primary inspection line customs officer. The airline was launched in November 2001 with a fleet of 12 Airbus A320 and 9 Boeing 737-200 aircraft, but by 2004 the airline had ceased flying. Air Canada retained "Tango" as a brand name for its cheapest airfare category. Using the theme "step into our world", Gander employees entered their first-ever float in the Gander Day festivities. The float was built around a passenger stand and was decorated with TCA bunting, 747 inflatables, posters and clowns, a revolving globe of live Smurfs and five women wearing uniforms from the past and present. While they did not take any honours, the group had fun participating. Even passengers passing through Gander on flight 861 had a chance to join in the festivities as Papa Smurf and his clowning friends provided a little in-flight entertainment. Most employees pitched in to make this year’s entry and plans are already in the works for something bigger and better next year. 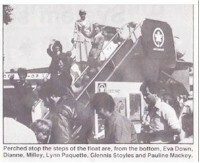 In our photo, pictured on the steps of the float, from the bottom: Eva Down, Dianne Milley, Lynn Paquette, Glennis Stoyles and Pauline Mackey. As of May 1, 2010, Air Canada cabins transition to all credit card purchases. In our convenient new cashless cabins, having the right currency to purchase Onboard Café, bar and/or duty-free boutique items onboard, and searching for and providing the exact change are no longer issues. Extract from "Regional News" magazine. 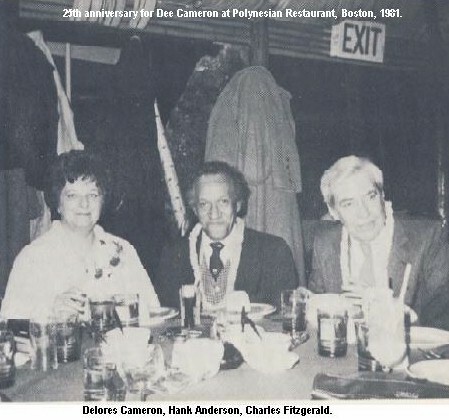 The staff at Logan Airport in Boston got together recently to wish Dee Cameron a happy 25th Anniversary with Air Canada. 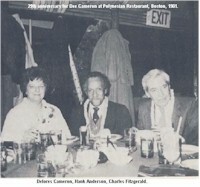 Ms. Cameron was taken to a Polynesian restaurant by local management and her co-workers, where she was presented with gifts and her annual pass. Seated are the guests of honour, Delores Cameron, Hank Anderson, airport manager and Charles Fitzgerald, district manager. When l was a child I would sit by the wharf and watch the planes from Logan airport come in and take off. Whoever thought someday I might be working for such a great airline company. Was my next important task. To get our passengers from Point A to B. Major customer service improvements continue to make yards for us in the South. With the recent introduction of ACCESS to Port of Spain. Both major daily papers here gave prominent mention of the new service. 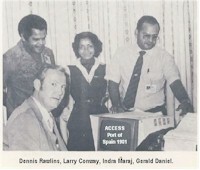 In this photo we have seated, Larry Conway, access coordinator, US & SR, explaining the nature of the computerized cargo tracing system to, from the left, Dennis Rawlins, airport manager, Indra Maraj, CSA and Gerald Daniel, station agent. Just how far will people go to get social media followers? 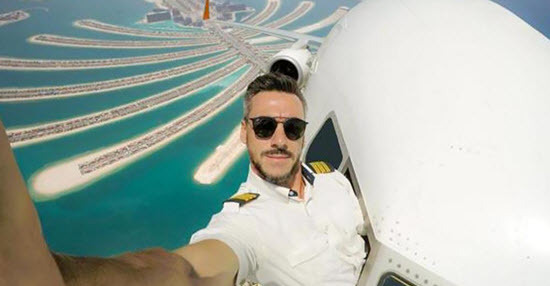 This Brazilian pilot, Daniel Centeno, has almost 77,000 people following his Instagram page, due to his death-defying plane selfies. This picture shows his plane flying high above the Palm Islands in Dubai, UAE. Many were skeptical as to whether these photos are real, as the speed at which the plane was going would not only throw off Daniel’s glasses but also probably be a mortal mistake. Turns out the images are Photoshopped (yet still awesome!). But you already knew that, didn't you? Click on image for full-size picture. MTU Maintenance Canada has just celebrated its 20th anniversary. CP Air to buy CP Hotels from "Horizons" magazine, November 1983. Canada Pacific Air Lines will buy Canadian Pacific Hotels of Toronto from Canadian Pacific Enterprises for $125 million before the end of the year. Dan Colussy, President of CP Air, has stated that this company was one of the several potential buyers of the chain of 16 Canadian and six international hotels which includes hotel restaurants and airline catering services. Colussy said this move signals recognition that the hotel and airline businesses are closely related. The companies will conduct joint marketing and promotion in the future. The hotel chain has been a wholly-owned subsidiary of CP Enterprises since 1963. Our Lockheed 18 Lodestar was one of those slated to join the Dutch East Indies Air Force in Java in 1940 where it was to have been given the serial number LT-926. However, when the Japanese overran Java, the Lodestar was diverted (seized, might be a better term) by the U.S. Government to the Army Air Corps as a C-60-LO and given the serial number 42-108787. The Army Air Corps never used the plane and released it to Canadian Pacific Air Lines in the early 1940's. 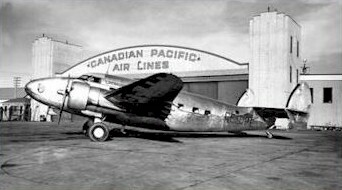 Canadian Pacific Railways purchased ten bush airlines in a short period of time, finishing with the purchase of Western Canadian Airlines in 1942, to form Canadian Pacific Air Lines. In 1943, the first Lodestar was delivered to CPA and was named CF-CPA. In 1943 seven Lodestars were allocated to CPA by the USAAF especially for use on the WSR, Alaskan Highway & Canol Pipeline. 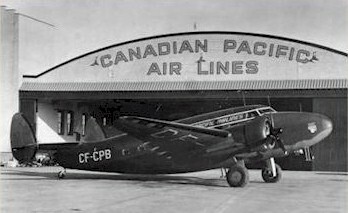 CF-CPA was assigned fleet nr 261 and sold in June 1950. E.D. Bourque Aerial Photography of Ottawa quickly bought the Lodestar and placed it into service on photo contracts in Canada's north. 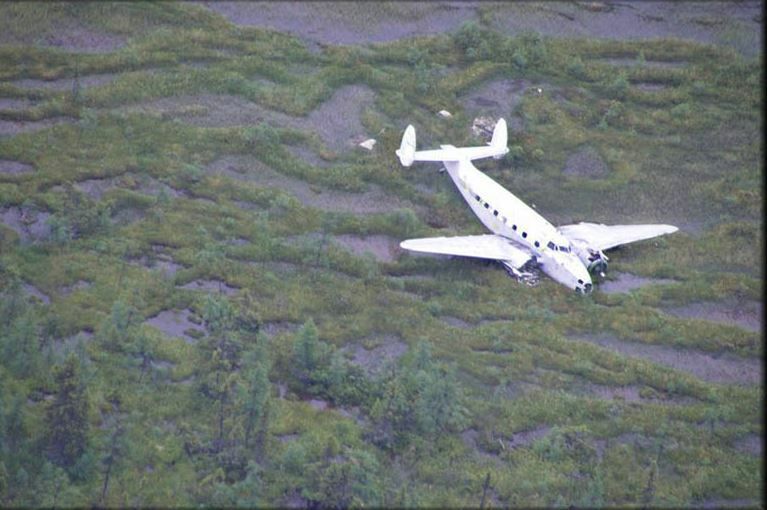 August 20, 1960, while CF-CPA was performing aerial photography, it suffered from fuel starvation and belly-landed 100 miles north of Schefferville, Quebec. Here we have photos of various aircraft. Good afternoon from Toronto, I look forward to each issue of the NetLetter, well-done chaps. In the latest issue was a note about stories & photos. I have one for you. Around 1968, David Lloyd (VE3AW) a businessman in Toronto who helped the CNIB find used ham radios for the blind, heard that CP Air might have some funds to help a local hospital in Vancouver where the patients were not blind but were suffering from polio. I received my “Ham” license in 1966 (VE7BXO), and I turned into the contact man along with one of our Navigators, Harry Beardsal who was also a ham. The hospital was Pearson in south Vancouver, and most of the patients had polio. Many were in “Iron Lungs”. Others were more mobile, they had smaller lungs which hung on their chest. With the assistance of Ian Gray, President, we got funding and the cooperation of Vancouver maintenance (Ian was an engineer and headed maintenance as VP before becoming President). We needed equipment, so Harry & I went on a flight to Tokyo which landed at Haneda airport we went to Akihabara and bought a Yaesu multi-band ham radio. I went through my old radio log books and found Harry Beardsal’s call sign; he lived in Burnaby; VE7ZQ. Back in Vancouver, we bought a three-element Yagi antenna. 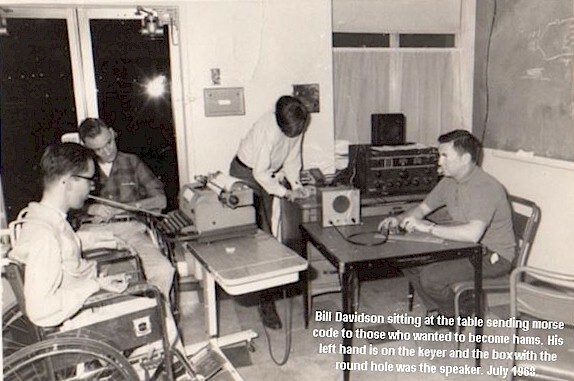 The station was set up in a room in the hospital, and the call sign was VE7PAR (Pearson Amateur Radio). My first ham radio contact with VE7PAR was 21 July 1968 when living in Richmond. The next big step was figuring out how someone who could not move could operate “Morse code” using a “keyer.” Well, the guys in maintenance knew what they were doing. They made chest pads which fit on the outside of an iron lung with I think Velcro attachments to hold the equipment; they designed code keyers which could be activated with a mouth stick. They came in, rebuilt the room, installing all the equipment, antennas etc. We talked to the Government Inspector who would do the testing of our students to check their proficiency in sending and receiving Morse code. I’m sorry I don’t remember his name but he took to our program, and all the students passed their Morse code. That was my job, in the photo, you see me sitting at the table sending Morse code to those who wanted to become hams. My left hand is on the keyer, and the box with the round hole was the speaker. At that time I was living in Richmond. I transferred to Toronto in 1971, and I was reassigned VE3CQU. My last contact with VE7PAR was 3 June 1972 when I was living in Mississauga. It was a memorable couple of years, the different airline departments working together for a worthwhile cause. A few of their names: Brian, Chester, Orv and Curly. I was lucky to know and be a part of a super group of airline employees working on this project. As a result of this article, I’m wondering if any of the polio group are still alive. There was a graduation party, and Ian Gray came to the hospital to hand out the operating license to each graduate. Back in those days, CP Air had their own “ham” radio club. 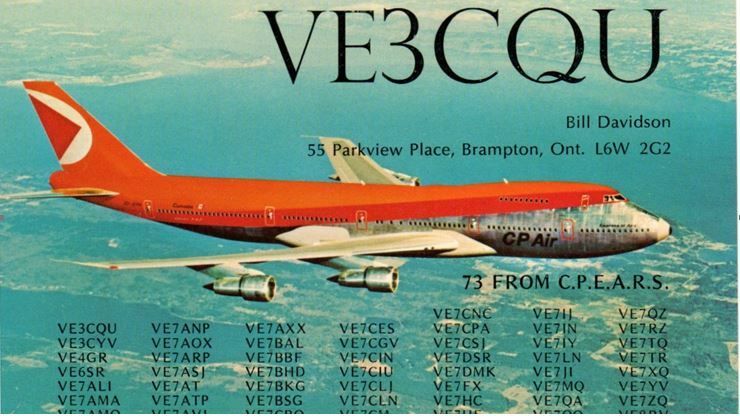 A chap named Mike Dukelow was running public relations, and he would arrange for each CP ham to get a supply of QSL cards with current aircraft (DC-8-63) on the front and also have printed on the back of each card the usual radio info including call sign and address of the ham. All for free from the company. On the front are call signs of CP membership. Note a lot of two-letter calls. I would sometimes operate “aeronautical mobile” on the DC-8-63 and DC-10-30 and B747-400. 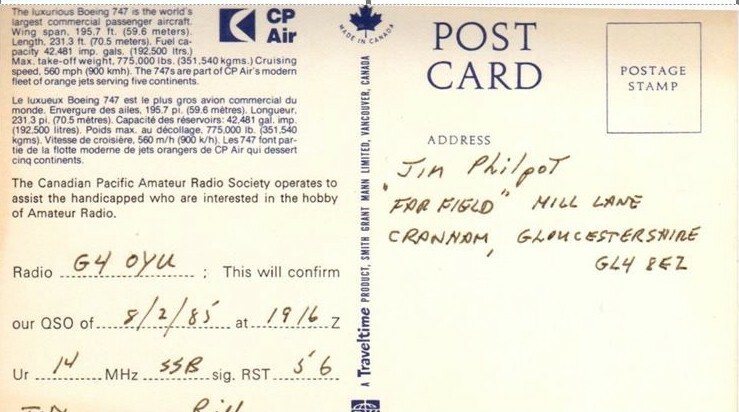 Since there were two HF sets I had permission from Transport Canada to use one to operate in the ham radio bands as long as I did not interfere with regular communications. I wasn’t the only one, I know of one pilot at Air Canada who also did the same. The NetLetter "Gang" are doing a great service to us retirees in bringing back memories. While looking around YouTube for an article topic, I came across a series of videos about two female pilots with Kenya Airways posted by justplanes.com. Although this item may be best suited to the ‘Women in Aviation’ section, I though that I would expand on their story. Captain (Irene) Koki Mutungi and First Officer Paula are both modest and charming but definitely inspirational as they describe their careers in aviation. Captain Mutungi was born into an aviation family (her father was a pilot) and obtained her private pilot’s license in Nairobi before moving to the United States and obtaining her commercial pilot’s license. She returned to Kenya in 1995 where she established a series of ‘firsts’ for female pilots in Africa. First female pilot hired by Kenya Airways, first African woman to become a captain on the Boeing 737, Boeing 767 and then the Boeing 787 Dreamliner in April 2014. First Officer Paula describes her airline career as being a "blessing" and “quite by chance” since she does not come from an airline family. She does seem to be a very natural communicator and her enthusiasm is obvious. I chose the most concise of the videos to link to here; there are many more available to enjoy. ‘Feelgood” stories can be hard to come across these days; I was very happy to find this one. Hello, I’m a producer with CBC News working with Ian Hanomansing. I’m writing to introduce myself and let the group know that we are continuing our research into what happened to CP Flight #21. As part of our research, we’re interested in speaking to anyone with a connection to the crash or anyone who may have information that could help shed light on this 50-year-old case. I would like you to contact Derek Humby, and ask him to email me. If he doesn't recognize the name, tell him to FaceBook me. Derek and I had a very long relationship, and it has been 17 1/2 years since we last saw each other. Edmonton-based independent ultra-LCC Flair Airlines stepped up its competition with the Canadian majors’ subsidiary LCCs Aug. 20 by announcing 11 new nonstop trans-border US flights for the upcoming winter season. History was again made on March 3, 1919, when Seattle-based aircraft manufacturer William Boeing and pilot Eddie Hubbard carried 60 letters from Vancouver's Coal Harbour to Seattle, marking the first international airmail delivery. The first commercial cargo flight in Canada took place in October 1913, when Montréal newspapers were carried from Montréal to Ottawa. Unfortunately, the aircraft crashed on the return takeoff. The first commercial passenger flight took place in 1920, when 2 bush pilots flew a fur buyer north to The Pas, Manitoba, from Winnipeg. One month later, the first regular services were initiated when Imperial Oil chartered several Junkers aircraft to ferry men and supplies from Edmonton to the newly discovered oil fields at Fort Norman (now Tulita), NWT. It wasn't quite an earlier Miracle on the Hudson as four on board perished, but 30 passengers and eight crew lived to tell the tale of Air France F-BAZS flight 152, a Tehran bound Lockheed Constellation forced to ditch off south-west Turkey in August 1953. The 38 survivors spent 1 hour on the wings before being rescued. Now, after 65 years on the seabed, the wreckage of the Connie has been located by a Turkish submarine crew. The Turkish Navy located the essentially intact aircraft February 2018 in 842 feet of water. Swoop, WestJet’s ULCC offshoot, has placed its fourth aircraft into service - a three-year-old Boeing 737-800 that continues the pattern of building the subsidiary's fleet with some of WestJet's youngest aircraft. The Canadian Aviation Historical Society (CAHS) celebrated Canada’s 150th Birthday on July 1, 2017 by publishing a list of 150 books about Canadian aviation. But they exceeded our goal – the list has 201 titles suggested by members! Where can you find books listed that you would like to read? Check your local library, bookstores and archival and aviation museum collections. If you can’t find what you want there, you will probably find the book you want with an internet search. A good resource for locating books is www.abebooks.com. It connects to an international network of book vendors in Canada, the U.S., England and Australia. One of the biggest gripes for many cruisers? Having to pull out of port before sundown, when the destination's dining, nightlife and performing arts scene is just revving up. Happily, savvy cruise lines have been increasing overnight, late-night or even multiple-night stays at select ports of call. This move gives cruisers the opportunity to more fully immerse themselves in the port's offerings, which can, after sunset, be quite different from daytime activities. For cruisers, craving destination immersion, late and extended calls are a welcome addition, as there just never seems to be enough time in port. Azamara Club Cruises, Celebrity Cruises, Crystal Cruises, SeaDream Yacht Club, Silversea Cruises, Princess Cruises, Paul Gauguin Cruises, Oceania Cruises, Regent Seven Seas Cruises and Windstar Cruises. Lambair, which was incorporated in 1935 as Lamb Airways Limited, began with one aircraft - a Stinson SR8 five-passenger plane. This plane was used to haul fish from The Pas, Manitoba to the railhead at Cormorant before the fish froze and before the market fell in Chicago. Tom Lamb, who established the airline, bought the Stinson in 1930 and taught himself to fly it. As development in the north progressed, Lambair opened new bases and served Wabowden, Thompson, Churchill, Norway House and Gillam as well as The Pas. These bases were established to serve all of northern Manitoba and the Northwest Territories. It carried out its own maintenance operations in its hangars at Churchill, Thompson and The Pas and in 1965 built a new headquarters at The Pas. Their motto was "Do not ask us where we fly . . . Tell us where you want to go"
At the time, Lambair was Canada's oldest airline still under the original management. Upon the death of Tom Lamb in 1969, the founder's six sons, all pilot-engineers, ran the airline. By 1979, Lambair had a fleet which included Bristol Freighters, Twin Otters, Otters, Beavers, Cessna 180s, Bell G4A helicopters, Twin Islanders, Aztecs and DC-3s. The planes were purchased from all over the world including Norway, England and Afghanistan. Lambair ceased operations and went out of business in 1981. When flying a kite in areas that also have air traffic, it's best to keep the kite reeled in to low altitudes. A man flying his kite near the inner harbour in Victoria, British Columbia soared to a height of 300 metres (984 feet). Air traffic controllers had to divert some incoming float planes. Police investigating the incident demanded that the kite immediately be brought in. The kite enthusiast thought he was just having fun with his hobby and was unaware of the risk that his kite could have posed to planes coming and going from the harbour. 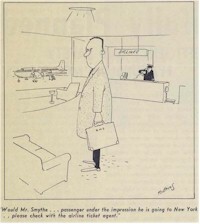 "Would Mr. Smythe ... passenger under the impression he is going to New York...please check with the airline ticket agent."